Adventures in the Endless Pursuit of Entertainment: Kids of Chicago do have a good time! Kids of Chicago do have a good time! I am back in NYC after one of the best weekends I ever experienced. It was my first trip to Chicago and I loved it just as I knew I would. On Friday, I spent the day exploring. 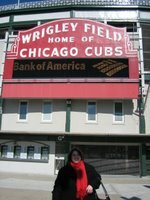 The most significant stop on my exploration was Wrigley Field. Of course, the season hasn't started but just standing in the shadow of the stadium was enough. When I was a kid growing up in West Texas, we had WGN on our cable and saw more Cubs games than any other baseball team. Our Dad became a huge fan and he passed on his love of the Cubs to my sister and me. Although he talked about going to Chicago or to Arizona for spring training, he never got the chance to see a Cubs game live so it was pretty special calling my Mom and my sister from there. 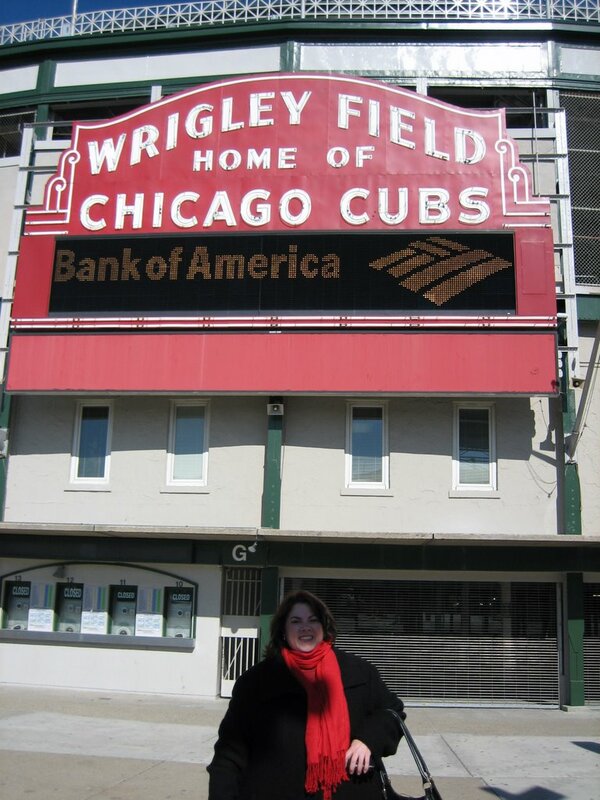 I spent the rest of the day just walking around, shopping, pub crawling and enjoying some great Chicago style pizza. I crashed early in my great hotel room which was just about bigger than my NYC apartment! 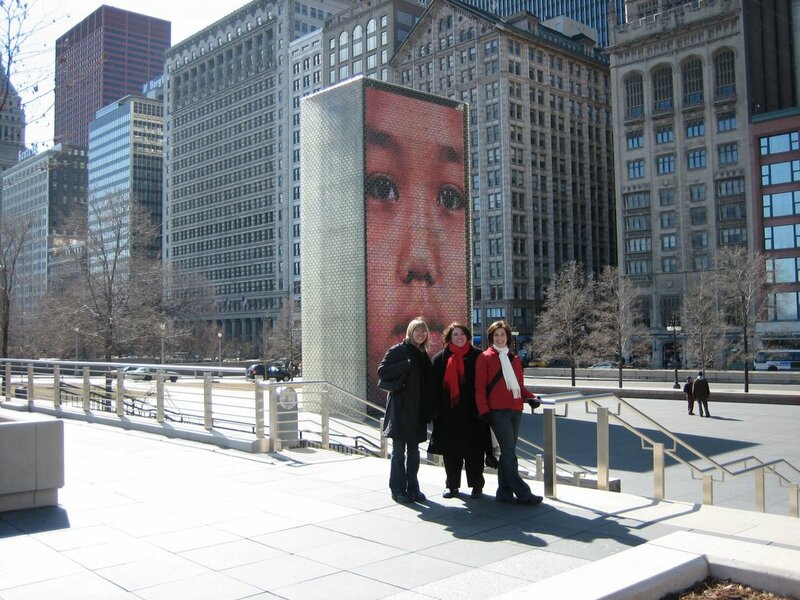 On Saturday morning, Kristin collected me from my hotel and we took a cab to the Art Institute where we met Kari and Mary Nell. Mary Nell treated us to a tour through the Art Institue - first stop was Suerrat's "Sunday on Le Grande Jatte" where we paid homage to Sondheim's inspiration for his pulitzer prize winning "Sunday in the Park with George". Oh my God. It was stunning. It was so alive and I almost saw the characters walk out of the paining. We saw a great collection - some extraordinary classics that I have only seen in books or prints - Kari expounds here. 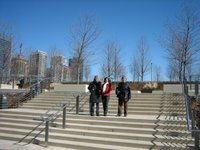 We then took a brief walk through Millenium Park and had a wonderful at the Park View cafe. 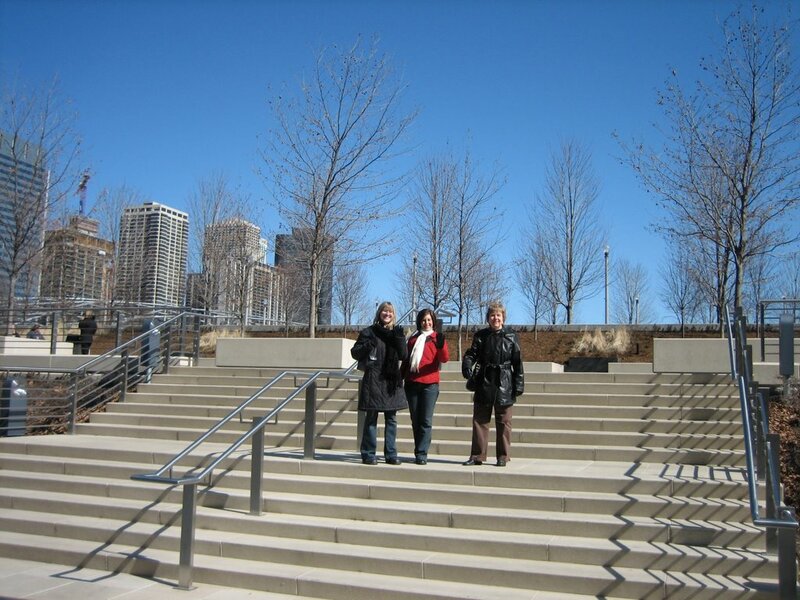 After Mary Nell left us, Kari, Kristin and I walked back to my hotel while they pointed out sites to me. Later in the evening, Kristin and I went to my first opera away from the Met and boy was I treated well there! "Der Rosenkavalier" was fabulous! experience did not disappoint either. Our friend Renee was there as well! She came out with Susan and another friend. She immediately saw Kristin and me and chatted with us. We had sort of a group chat with Suzy and Renee. I told them that it just worked out so perfectly to come for the weekend to get to see both of them perform. They are just such fun girls! We were the last two with them so we walked out with them. It turned out that we were actually walking to almost the same destination...finally Renee realized that Kristin and I were right behind them so she joined us. She told us that she received some lovely birthday cards from the group recently and then told us about her trip to Russia - she had a good time but did NOT like the 30 below weather - Sage loved St. Peterburg though. She was happy that we were coming to her recital and said that she would see us there. 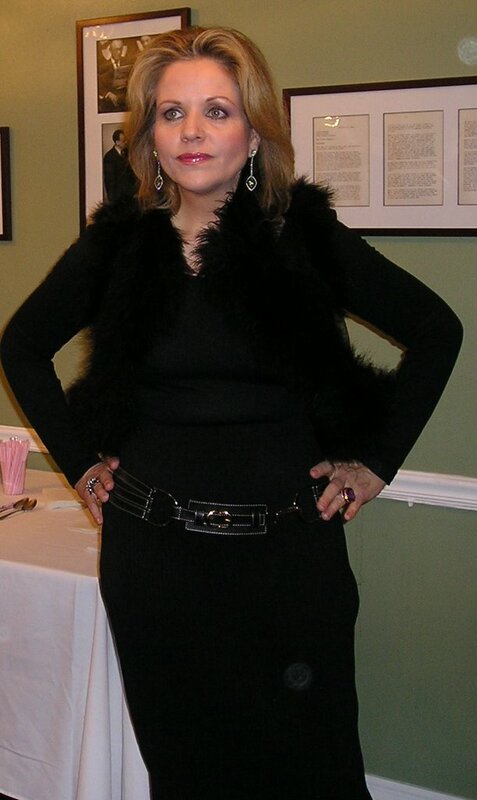 Kari was my chauffer to Dominican University for "Sunday in Oak Park with La Diva Renee". She did a fabulous job getting us there exactly on time on such a messy snowy day. Everytime I hear Renee sing, I say "this was the best I've ever heard her sing". Well, this time it really was the best! Time after time she outdoes her previous performance and all expectations are exceeded. The hall was intimate and accoustically outstanding to my troubled ears. 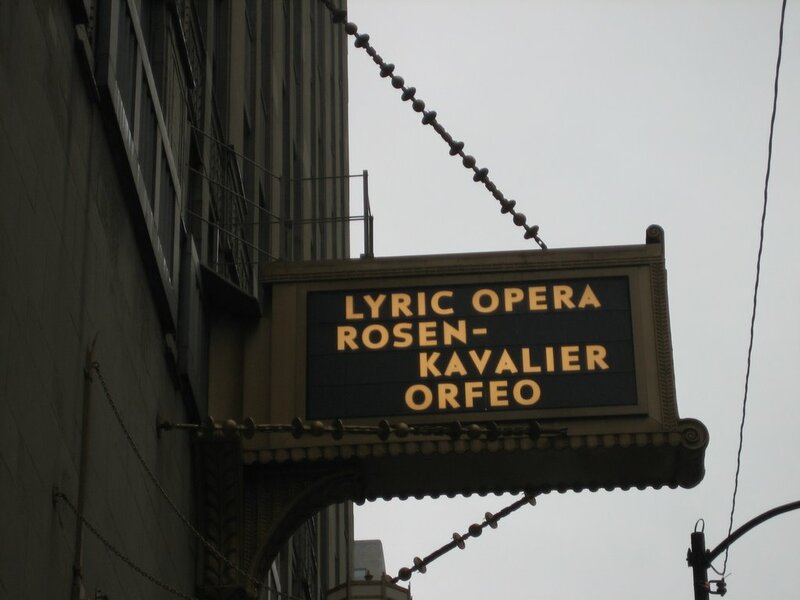 It was an enthusiastic audience regardless of whether or not they were opera fans (I was surrounded by nuns, not of the Maria Von Trapp variety). It was such a treat that she substituted the aria from Il Travatori. Oh my. She is just too much. When explaining "Apparition", she broke into "Circle of Life" from Lion King and got a big laugh. When she sings at Carnegie or the Met, there is depth, emotion, beauty...but when she is out on the road, the entertainer in her really surfaces and her charm is even more evident. We were all in the mezzanine or balcony but the seats were great. We all thought she was looking directly at each of us. It was great to see Mary Nell's sister again and to meet Kristin's mom and the new member Stephanie and her husband. It is always such a fun event to be with TBV. In the green room, Renee greeted us as a group and took a few pictures with some of us. She told me "long time no see" and then proceeded to put me on the spot first by asking what I liked in the program. Talk about pressure! Uhhhhh. Thank goodness I had my program in my hand and was able to show her. I had to admit that I only found the "Apparition" interesting - I actually found it too depressing and difficult. She also wanted to lend me her gorgeous green jewel and diamond drop earrings that just happened to match my sweater...but she said she was already borrowing them - as well as her rings! I told her I would borrow the circle of diamonds ring but I know she likes her bling. I asked her what she was planning to sing at the Volpe gala and she said that they didn't know yet and I mentioned that it was the day after the last Rodelinda and she nearly had a panic attack. We bid her goodbye and then moved on to a lovely French bistro. It was a delicious meal and great company - so many wonderful musical theatre stories were shared!! Kari delivered me back to my hotel safe and sound. I just did some more exploring today. I am already looking forward to my next trip to Chicago in August! This was an unforgettable trip.